I cant think of any other place in the world that I would rather be than deep in the backcountry of Rocky Mountain National Park to capture sunrise at a beautiful mountain lake. Ouzel Lake in the Wild Basin section of Rocky Mountain National Park fit the bill perfectly this September morning. 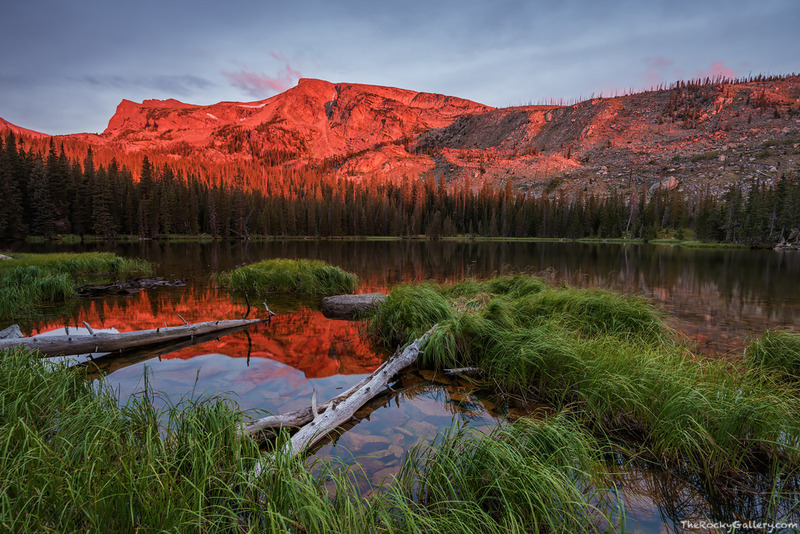 Ouzel Lake was as a smooth as glass and clouds filled the skies over Mahana Peak as the daylight set the granite ablaze. Two bull moose grazed near outlet of Ouzel Lake and other than an occasional sound of chirping birds Rocky was quiet and still. Photo © copyright by Thomas Mangan.